Her strength following the Manchester attack has been amazing. On May 22, 2017, a suicide bomber detonated an explosive in the Manchester Arena in Manchester, England. It took place as fans and families were leaving a concert by singer Ariana Grande. News of the attack traveled quickly across social media platforms such as Twitter as families and loved ones looked to be reunited amongst the chaos. Twenty-two people fell victim to the attacks along with countless others being injured and traumatized. What was especially sickening about the attack was when considering the audience that was in attendance. Children and their parents, teenagers and young adults, had left their houses to enjoy a night out listening to one of their favorite artists. The youngest victim of the attack was just eight years old. Countless musicians, celebrities, and friends of Grande hopped onto social media to show their support for the singer and the city of Manchester. Hashtags were created along with images that showed their support. On May 26th, Grande officially reached out to her fans in the form of a letter posted to Twitter. In this letter, she encouraged her fans to unite and stay strong in this hard time. She also announced that she would be returning to Manchester for a benefit concert. 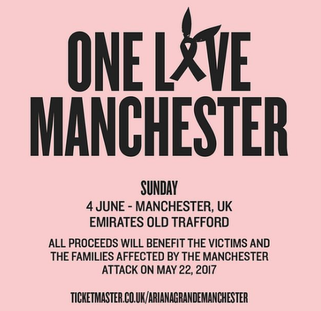 One Love Manchester, the title of the benefit show, will take place on June 4th in Manchester. Other musicians such as Miley Cyrus, Justin Bieber, Niall Horan and Coldplay will be joining the line-up. The money raised will be going to those directly affected by the suicide bombing. Ariana Grande has been able to remain unbelievably strong in such a hard time, but, then again, despite her young pop star image, she has always been a strong and inspirational woman. Here are 10 of Ariana Grande’s most inspirational quotes that will remind you that — regardless of terror or fear — you can definitely handle whatever life is throwing at you. This is amazing advice for any situation. Do what you believe is right or what you believe you need to do. These are lyrics from her song "Put Your Hearts Up". We should probably be blasting this song on repeat. This is from Grande's letter to her fans after the attacks. It definitely inspires us to stay strong. If she doesn't have any regrets, neither should we. This can be about anything! Another quote straight from her letter to her fans! This can be your new daily motto. Or maybe this will be your new daily motto. A final piece of inspiration from her letter to fans after the attack. But it's a good piece of advice for any occasion.